“I like the other Doctor, the one we haven’t seen in a while! The one with the dark hair!” Well, our son’s in luck, because this is the tenth anniversary adventure, and the first time that Doctor Who had brought back a previous incarnation, or two, of the hero. I enjoyed myself by not telling him the title, starting the episode midway through the credits, and letting him enjoy the surprise. Since this is one of the most celebrated stories of the series, I wonder whether many people have had the opportunity to see it without knowing that Patrick Troughton and William Hartnell were back in it. Well, mostly. 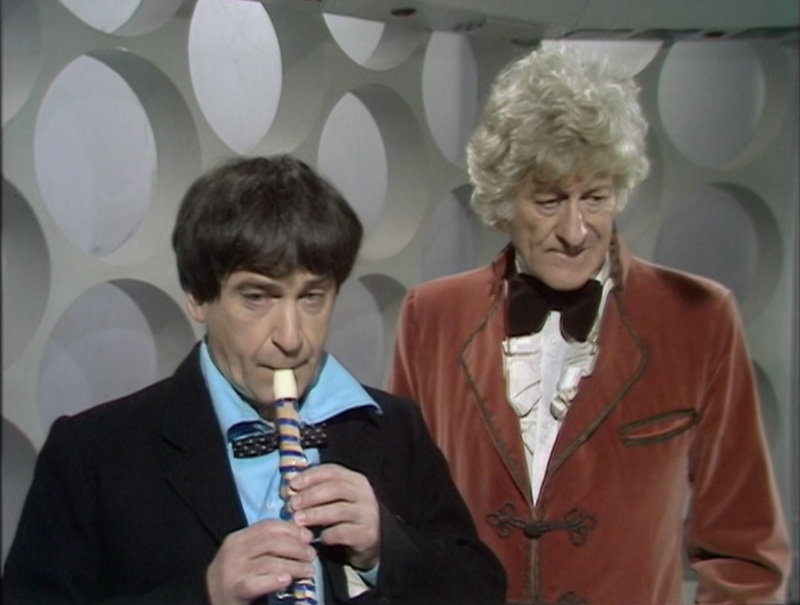 Conventional wisdom holds that the massive fun of Pertwee and Troughton squabbling patches over several pedestrian moments in a silly story, but the biggest shame is that Hartnell was just far too ill to participate much. He’s limited to some pre-filmed segments at Ealing Studios and played back in the studio, which remains a huge shame. Anyway, the story is by Bob Baker and Dave Martin and it’s directed by Lennie Mayne, who brings in actor Rex Robinson for a supporting role for the first time. Mayne directed four Who serials and cast Robinson in three of them. He also used Robinson in an episode of The Onedin Line and a couple of installments of Warship. I love seeing how BBC directors in the seventies went back to trusted names.